St. Gallen, Switzerland… September 1938 – Colonel Paul Gruninger was a senior officer of the Swiss police. In August 1938, after the Anschluss (German’s annexation of Austria in March), the Swiss government sealed its borders prohibiting the entry of Austrian Jews into neutral Switzerland. 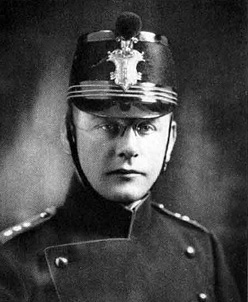 Colonel Paul Gruninger, who was in charge of the Swiss border canton of St. Gallen, disregarded the order and permitted between two to three thousand Jewish refugees to enter Switzerland illegally. The following year, he was dismissed from his post and lost his police rank and all pension rights. In 1940, Gruninger was brought to trial, was found guilty of fraud. He served time in jail and was fined. For the remainder of his life he struggled to make a living, which was difficult in Switzerland with a criminal record. Paul Gruninger passed away in 1972. In 1995, fifty years after the war had ended and twenty-three years after his death, in the same court room where he had been condemned, other judges decided to reopen the trial and absolved him from the charges. In 1996 Paul Gruninger was completely “rehabilitated” by the Swiss government.